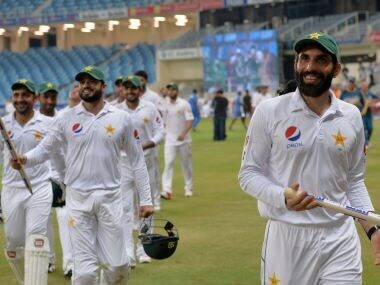 Dubai: Despite a fighting hundred by Darren Bravo, Pakistan pulled off a tension-packed 56-run victory against West Indies in the first day-night Test in Dubai on Monday. Bravo kept Pakistan's victory bid on hold during his resistance-filled 410-minute long 116 and it needed leg-spinner Yasir Shah to make a stunning two-handed catch to end his innings. West Indies were finally bowled for 289 with just 12 over left in the match. Bravo lingered on his haunches at the crease for a minute before trudging back to the pavilion, disappointed at his dismissal after bringing so close a draw or an upset win. Bravo's eighth Test hundred spiced with ten boundaries and a six had brought West Indies within 83 runs of victory and 27 overs to bat for a draw after they were set a daunting 346 runs to win. Left-armer Mohammad Nawaz trapped Devendra Bishoo while Miguel Cummins and last man Shannon Gabriel were run out to spark a celebration amongst Pakistan players. Paceman Mohammad Amir finished with 3-63 and Shah took 2-113. The match was a good advertisement for Test cricket as it had a triple hundred (302 not out) by Azhar Ali, 8-49 by leg-spinner Bishoo and two fighting knocks by Bravo. Pakistan had never hoped to strive that much after getting an important wicket of Marlon Samuels with the first ball of the day but Bravo left them frustrated and near to capitulation. This was Test cricket's second ever day-night Test played with a pink ball after Australia and New Zealand featured in the first at Adelaide in November last year. The win is more memorable for Pakistan as the match marked their 400th Test since they began the five-day format in 1952. 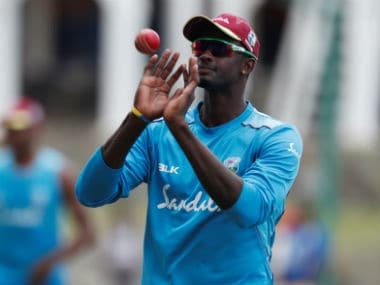 Bravo first added 77 for the fifth wicket with Roston Chase (35) and then another 69 for the seventh with skipper Jason Holder who made 40 not out. Pakistan had taken the second new ball with West Indies 224-6 and Bravo needing four for hundred. Bravo smashed an uppish drive off Amir's first ball to backward point boundary to complete his magnificent hundred after 329-minutes of defiance. Bravo and Holder took the West Indies within 100 of victory in 41 overs after they reached dinner at 232-6. Chase, famous for his 137 not out at Jamaica which helped West Indies draw a Test against India in July this year, gave full support to Bravo as the duo frustrated Pakistan. Pakistan captain Misbah-ul-Haq lauded the win. "The way the Pakistan team is playing they are keeping Test cricket alive," said Misbah, who now has 23 wins in 47 Tests as captain. "Credit to West Indies, the way Bishoo bowled. Even in the first innings, they batted well. We got out cheaply in the second innings and got out to loose shots. Bravo was wonderful and fought hard." 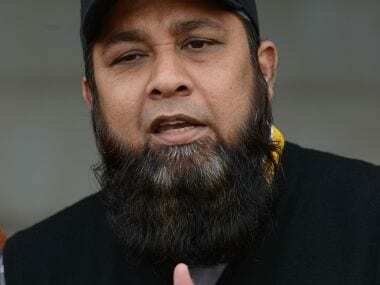 The West Indian captain praised his team's fight till the bitter end. "It was a good fight, but still disappointed we din't get over the line. 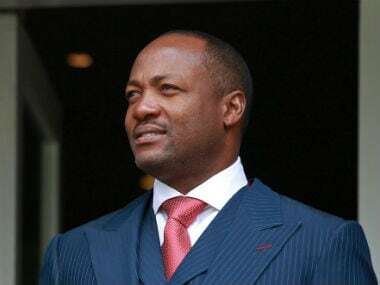 Bishoo's spell and Bravo's knock were inspirational. Definite signs of improvement in performance," said Holder. Pakistan's hopes rested on Shah who was not at his best despite the good turn on offer. He finally got his first wicket when he bowled Chase from across his feet. Paceman Wahab Riaz then dismissed Shane Dowrich for nought to leave West Indies at 194-6. West Indies had resumed at 95-2 and were instantly in trouble when Amir had Samuels caught behind for four with the first ball of the day. Jermaine Blackwood (15) helped Bravo take the total to 116 when left-arm spinner Mohammad Nawaz trapped him leg-before, a decision Pakistan only got on referral. Pakistan did not get what was expected from Shah in the first session as he bowled faster rather than giving flight to the ball. The remaining two Tests will be played in Abu Dhabi (21-25 October ) and Sharjah ( 30 October 30 -3 November).